Brenda will graduate Uhuru Academy in 2019 and believes, “the teachers here are more considerable about our education.” There is not a day that goes by that Brenda does not brighten the school with her huge smile. She lives with her two younger siblings and in Ruai during school breaks. Because she has seen corruption and guilty people use money to evade justice, Brenda wants to be a lawyer to fight for people’s rights. In her downtime, Brenda likes to read and skate. 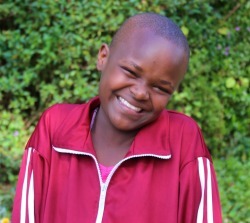 Click here to sponsor a student like Brenda.